Melekouni is a traditional sweet, that people offer in weddings and christenings. Apart from that, melekouni is also well known for its nutritious ingredients. It can be a great option for those of you who are looking for great alternatives of sweet flavors. It is made from aromatic thyme honey, natural sesame, almonds, orange and lemon peel and various spices (depending on the area), free of sugar. It is soft, with a balanced taste of all of its ingredients. Melekounia are cut in diamond shapes. They may look a lot alike the well known sweet “pasteli”, mostly because both of them have as primary ingredient the sesame, but they are very different, because of of all of the other ingredients and the different way of preparation. The name “Melekouni” originates from the Ancient Greek. 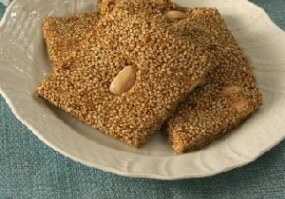 It consists from two parts, “Meli” (honey) and “Kouna“, as we call seeds in Rhodes.